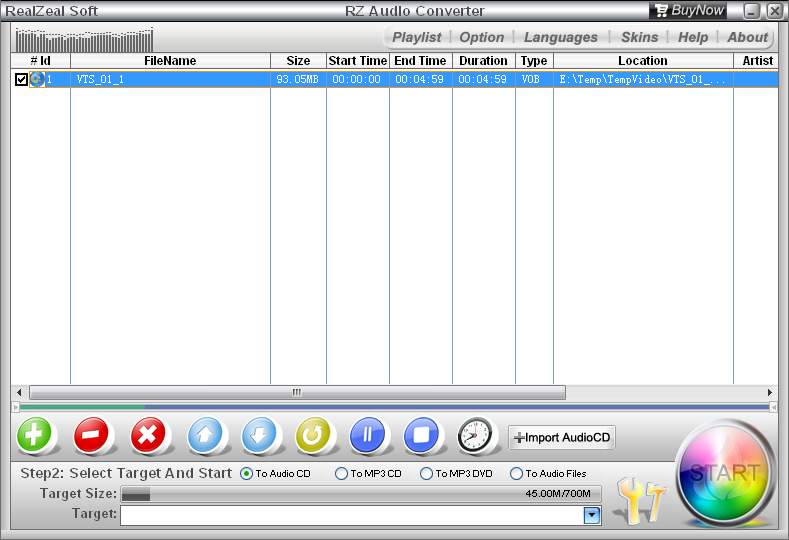 RZ Audio Converter provide the total solution of converting audio files, it is an all-in-one and easy-to-use audio converter software that convert audio files from one format to another, or extract audio tracks from videos, can convert any videos and audios to MP3, M4A, AAC, AC3, OGG, WMA, WAV, etc., can burn AudioCD, MP3 CD, MP3 DVD, can extract audio files from AudioCD. It's the most powerful and cost-effective audio file converter for you. 1. Support all popular media files as source, such as: WMA, MP3, WAV, FLAC, AC3, AAC, M4A, AMR, AVI, MP4(MPEG-4), H.264, H.263, Xvid, DivX, MPG(mpeg-1, mpeg-2), Mkv, WMV, MOV, RM, RMVB, 3GP, Flv, ASF, OGG, VOB, DVD, CD, etc. 2. Convert all popular media files to MP3, WAV, WMA, AAC, M4A, AC3, OGG, AMR, etc. 3. Extract audio tracks from all popular video files, and then save to MP3, WAV, WMA(wma2), WMA(wma3), AAC, M4A, AC3, OGG, AMR. 4. Extract audio tracks from Audio CD, and then save to MP3, WAV, WMA(wma2), WMA(wma3), AAC, M4A, AC3, OGG, AMR. 5. Burn AudioCD, MP3 CD, MP3 DVD, etc. 6. Our High Performance and High Quality processor engine, offer the best audio quality. 7. Offer pre-defined target audio file templates for all popular audio files profile, easily convert to any popular audio files. 8. Customize the target audio file, such as audio compressor, audio encoder, audio bitrate, audio sample rate, audio channels, etc. The Best Video Audio Converter for Zen! Qweas is providing links to RZ Audio Converter 1.50 as a courtesy, and makes no representations regarding RZ Audio Converter or any other applications or any information related thereto. Any questions, complaints or claims regarding this application RZ Audio Converter 1.50 must be directed to the appropriate software vendor. You may click the publisher link of RZ Audio Converter on the top of this page to get more details about the vendor.